People's Trust Insurance and Rapid Response Team teamed up on National Rebuilding Day to help the Griffin Household make much needed repairs. It’s amazing what a transformation and difference we can make in the lives of people who need it the most when we get together as a community. In celebration of National Rebuilding Day on April 30, People’s Trust Insurance Company and its affiliate, Rapid Response Team, joined forces with the Rebuilding Together Broward organization to help make critical home improvements and provide safe and sanitary living conditions to homes of those most in need. Rebuilding Together Broward is a nonprofit organization that provides home repair assistance to low-income, elderly and veteran homeowners in Broward County, Wilton Manors, Pompano Beach, Hollywood, Pembroke Pines and Miramar. 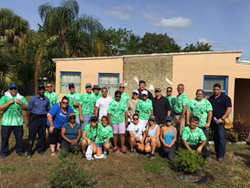 This April will mark the second year that People’s Trust and Rapid Response Team have participated in Rebuilding Together Broward. Last year, Rapid Response Team Roofing, a division of Rapid Response Team, worked with Rebuilding Together Broward to completely re-roof the home of Fort Lauderdale resident Alfreda Echols, free of charge. This year, People’s Trust and Rapid Response set their sights even higher for National Rebuilding Day. More than 25 employees came out and donated their time and skills to the Griffin household of Fort Lauderdale. Major improvements included replacing all kitchen cabinetry, helping fix plumbing issues, building a shed to house the water heater, landscaping, painting and several other major repairs. Ms. Griffin said "she had dreamed about this for 15 years and is so thankful to have the help to make repairs on her home." Founded in 2008, People’s Trust Insurance has emerged as one of Florida’s top 10 home insurance companies, providing homeowners with affordable rates and benefits not available anywhere else. Honored with the 2013 Enterprise Florida Governor’s Innovators in Business Award, People’s Trust provides a “Better Way” for more than 150,000 Floridians to insure their homes. With more than 600 employees in its family of companies and an affiliation with Florida’s largest residential insurance restoration general contractor, People’s Trust is Florida’s best-prepared home insurance company and a full partner in policyholders’ recovery after loss. Rapid Response Team is the largest insurance restoration general contractor in Florida. A proud affiliate of People’s Trust Insurance, the Rapid Response Team provides 24/7 emergency water mitigation, high-quality restoration services and managed repair coordination exclusively for People’s Trust policyholders. With a full-time staff of more than 350, the company operates a fleet of more than 150 repair trucks and other vehicles ready to deploy at a moment’s notice. The Company operates 12 Response Centers throughout the state that contain supplies that may be needed in the event of a loss or disaster, such as water mitigation equipment, tarps, plywood and generators. Rebuilding Together Broward provides home repair assistance to low-income, elderly and veteran homeowners in unincorporated Broward County, Wilton Manors, Pompano Beach, Hollywood, Pembroke Pines and Miramar.